With the Send Later feature, compose an email and schedule it to send at a later time. Emails can be scheduled from the CRM, or from Gmail or G Suite inboxes using the HubSpot Sales Chrome extension. Once an email is scheduled, it cannot be edited, only deleted and replaced with a new scheduled email. Please note: your inbox must be successfully connected in order to schedule an email for later. 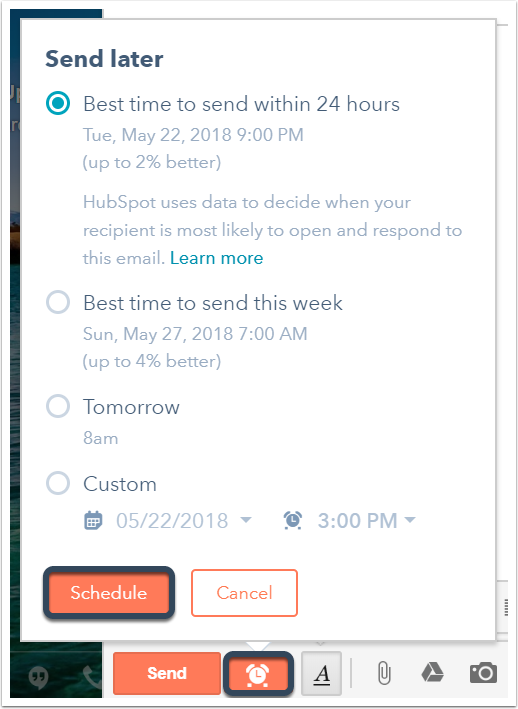 Gmail, Office 365, and IMAP connected inboxes support the send later feature when scheduling emails from the CRM. In the left panel, click Email email. Tomorrow: send the email tomorrow at 8am; click the dropdown menu to specify the recipient's timezone. Custom: set a specific date and time for your send. Best time to send: (Sales Hub Professional or Enterprise only) select within 24 hours or Best time to send this week to schedule a time with a higher likelihood of opens, clicks, and replies based on the recipient's previous email engagement. Once the email has been scheduled, the email will be logged on the record with a status of Scheduled. To cancel the email send, hover over the email activity on the timeline and in the upper right, click Delete. Please note: emails scheduled for later in the HubSpot CRM will not show up in your Gmail drafts folder. 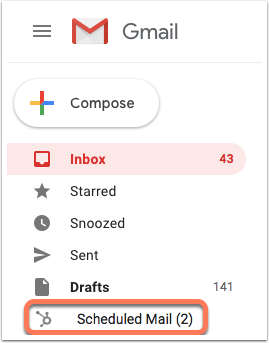 Please note: this feature is only supported in Gmail and G Suite inboxes using the HubSpot Chrome extension. Office 365 and IMAP connected inboxes can still schedule emails directly in the CRM, but they cannot schedule emails directly in their mail client. Compose a new email in Gmail and add an email recipient. Tomorrow: send the email tomorrow; click the dropdown menu to specify the recipient's timezone. In your inbox, click the Scheduled Mail folder in the left sidebar menu. On the Scheduled emails screen, view your queued up emails. Hover over an email and click Delete to cancel an email send, or click Preview to see the drafted scheduled email. How does HubSpot determine the best time to schedule the email? Your recipient’s engagement with HubSpot-sent emails in the past. This data is gathered by looking at recipients' email history in your HubSpot account; your send history is not shared with other HubSpot users. Similar recipients’ engagement with HubSpot-sent emails in the past. Your recipient’s device (mobile or computer). What if my scheduled email is not sent? If your inbox is disconnected at the time your email is scheduled to send, the email will not be sent. Reconnect your inbox to HubSpot, then reschedule the email. If you scheduled the email using the HubSpot Sales Chrome extension in your Gmail inbox, refresh Gmail to restart the extension. Then reschedule your email.